"Mmm...donuts." Homer Simpson’s infamous ode to the sweet breakfast treats speaks the simple truth: Few things in life are as gratifying as fried dough coated in sugar. I may be more of an enthusiast than most. But given the sheer volume of donut shops in Hamilton County, I can’t be the only one. Whether you spell it donut or doughnut, here’s a list of donut shops in Hamilton County, Indiana. Scroll down to learn more about each of these tasty bakeries. White House Donuts on State Road 32 in downtown Westfield opens at 5 a.m. Tuesday-Saturday and closes at 11 a.m.—if the fresh-made donuts last that long. There’s nothing fancy about this family-owned and -operated shop, but the superior quality explains its status as a local favorite. Boden’s Bakery on Sheridan Road in Noblesville is open from 6 a.m. to 2 p.m. Tuesday-Friday and 7-2 on Saturdays, but donuts have been known to disappear by mid-morning. If you’re lucky enough to snag a glazed yeast donut or one of the other made-from-scratch options, you’ll know why. The Dancing Donut is even more difficult to wrap your mouth around. The innovative Indianapolis bakery sells its wares at The Flying Cupcake in Fishers Marketplace, but only from 9 a.m. to 1 p.m. on Sundays—or until they are sold out. Show up early for flavors like the banana-cream-filled Copa Banana (a yeast donut topped with chocolate ganache and coconut) or the Brown Butter Crumble. Krenolies Donuts has two Hamilton County locations: the original along State Road 37 in Noblesville and a newer outpost on Allisonville Road in Fishers. Open daily from 6 a.m.-noon, it offers all the varieties you would expect—and then some. For something a little different, try the PB&J or the powdered lemon jelly. Taylor’s Bakery on 116th Street in downtown Fishers opens at 7 a.m. Monday-Saturday, buying early birds one extra hour of shut-eye. But late sleepers rejoice: It’s open until 6 p.m. 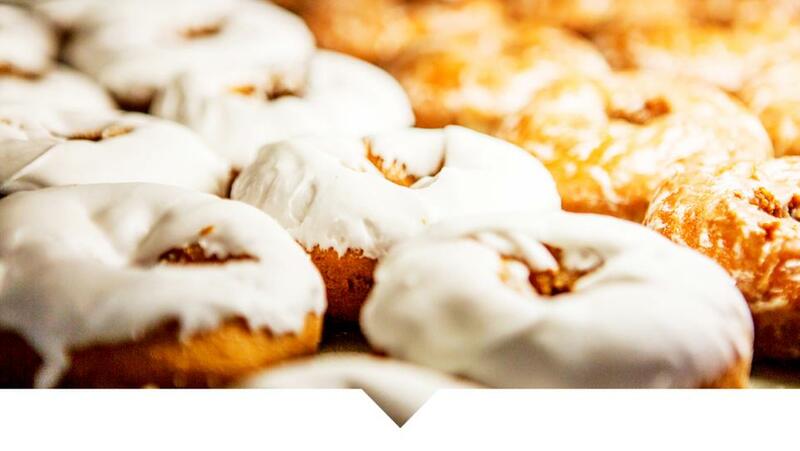 Although the 104-year-old family-owned bakery specializes in cakes, its donut holes have been voted Indianapolis’ best. Donuts are baked at Taylor’s Allisonville Road shop each morning and transported to Fishers. Jack’s Donuts, meanwhile, recognizes that donuts aren’t just for breakfast anymore. Its three Hamilton County locations—East 131st Street in Fishers, Carmel Drive in Carmel, and Carey Road in Westfield—are open from 5 a.m. to 9 p.m. almost every day. (The Carmel location closes at 3 p.m. on Sundays.) The Tiger Tail is a customer favorite, but try the S’mores Cinnamon Roll if you’re feeling extra adventurous. Titus Bakery & Café on Wheeler Road in Westfield is my new favorite—and not just because of its melt-in-your-mouth Pershing (think cinnamon roll meets donut), although that is a factor. Open daily from 6 a.m. to 6 p.m., Titus offers something I haven’t seen at any other local donut shop: a drive-thru. It’s the perfect option for those days when you know what you want and you don’t want to be tempted by all the eye candy inside. Check out our restaurants & dining page for more great eats in Hamilton County, Indiana and be sure to follow us on Facebook, Twitter and Instagram to see what&apos;s happening in #VisitHC. Happy eating!